Journal of Traumatic Stress, the official publication for the International Society for Traumatic Stress Studies, is an interdisciplinary forum for the publication of peer-reviewed original papers on biopsychosocial aspects of trauma. Papers focus on theoretical formulations, research, treatment, prevention education/training, and legal and policy concerns. 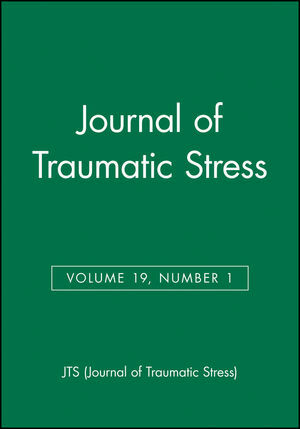 Journal of Traumatic Stress serves as a primary reference for professionals who study and treat people exposed to highly stressful and traumatic events (directly or through their occupational roles), such as war, disaster, accident, violence or abuse (criminal or familial), hostage-taking, or life-threatening illness. The journal publishes original articles, brief reports, review papers, commentaries, and, from time to time, special issues devoted to a single topic. The Journal of Traumatic Stress is a peer-reviewed academic journal published bimonthly by Wiley-Blackwell on behalf of the International Society for Traumatic Stress Studies. The editor-in-chief is Daniel Weiss.